Whatever, you're getting cheese fries. This Mean Girls day, lucky New Yorkers chowing down on cheese fries near Times Square were anything but whatever, as the snack was served by none other than Tina Fey. 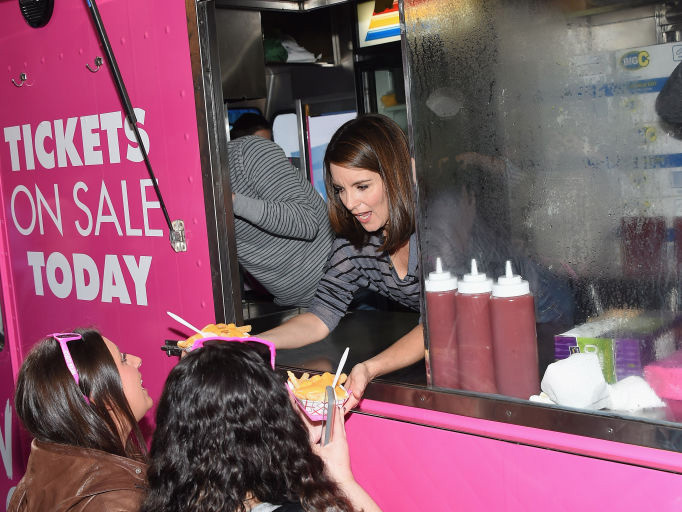 Tickets to the new Broadway adaptation of the classic 2004 film went on sale at 10 a.m. this morning at the August Wilson Theatre box office, where the mass of waiting fans was greeted by hot pink food trucks bearing free cheese fries. Even less-expected than the trucks, though, was Tina Fey herself. The writer of both the Mean Girls movie and its new Broadway version can be seen on Broadway.com's Instagram handing out cheese fries to the line of pink sunglasses-wearing fans. For the uninitiated Mean Girls day isn't actually the anniversary of the movie's release, but rather the day that Cady's crush, Aaron Samuels, asks her what day it is. Also for the uninitiated, the significance of the cheese fries (beyond cheese fries' normal, massive significance) is derived from one very simple line in the movie. Leader of the Plastics (the name of the mean girls' clique) Regina George (Rachel McAdams) is trying to calculate the percentage of calories from fat in a diet bar that allegedly burns carbs, but after an attempt by protagonist Cady Heron (Lindsay Lohan) to teach her the math, she characteristically decides not to care, and says "Whatever, I'm getting cheese fries." Whether the iconic line will make it into the musical, which opens April 8, 2018, with previews beginning March 12, we don't yet know, but given that it's made enough of a mark to warrant Tina Fey giving away cheese fries, the importance is clearly recognized. Following the theater stop, the truck will head to 43rd Street between 7th and 8th Avenues, where it will stay until 3pm, and then to Union Square West between 16th and 17th Streets from 3:30 to 4:30pm. Stop trying to make fetch happen and just head over now!